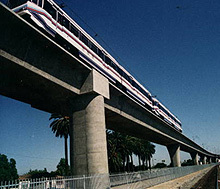 Mr. Tamannaie designed two LRT viaducts at Dominguez Junction and Slauson Avenue for the transit system as alternatives to precast designs on an exceptionally fast schedule before the bid. In addition, the designs of the multispan station structure, piggybacking on the mainline viaduct at Slauson Avenue, and a maintenance flagging structure were provided. The cast-in-place designs incorporated state-of-the-art structural configurations with split superstructure for lightness, outrigger bents that accommodated congested exiting settings on the ground, deep pile shafts and challenging seismic conditions in southern Los Angeles County. Additionally, the design accommodated complex power duct banks and other utility systems inside the super- and substructure. The successfully completed design was incorporated in the bid alongside the precast options designed by others and was the winner of the bid for construction. 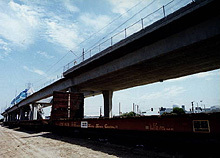 Mr. Tamannaie designed the Compton Boulevard (Marine Avenue) LRT Viaduct Overpass for the transit system following the Blue Line. This project also featured busy urban settings in Los Angeles County and site utility congestion, requiring creative structural layout, outrigger bents, deep shaft foundations and phased foundation construction. The foundation design was readied for construction through a separate contract to accommodate the relocation of the existing utilities. Construction of the sub- and superstructure followed later when all utility and foundation work was completed. During employment with Caltrans, Mr. Tamannaie designed the track alignment, roadbed and drainage for the Sacramento downtown's portion of the system's route. The design included the horizontal and vertical structure alignment for the 16th street/UP separation, as well as the geometric design though downtown Sacramento and K Street Mall. Designed the ladder-type storage tracks layout and underground drainage system for the vehicle storage yard area.